Japanese Episode DP 027: "Decisive Battle! Potchama vs. Pottaishi!!" American Episode 491: "Settling A Not-So-Old Score!" As Hikari's Pachirisu runs around the Contest stage, its trainer has an idea! Reaching into her pocket, Hikari pulls out a Poffin. The snack calms her pokemon down, allowing it to focus and complete the Appeals round with a display of its electrical attack. As the Contest continues, Hikari wonders if Pachirisu's initial blunder will prevent her from moving onto the second round. Once the other Coordinators have finished their Appeals, the judges announce the results. Much to Hikari's relief, she's made it into the second round, as has Kengo. Hikari's first match in the second round is against Candy Musalina and her Dokucale. The poison moth pokemon is able to hold its own for a while, but Hikari's Potchama is able to defeat it with a combination of Bide and Peck. The second round continues as both Hikari and Kengo fight their way to the final round. The childhood rivals promise to do their best as Kengo sends his Pottaishi out to battle Hikari's Potchama. After a few exchanges, Hikari gets the idea to have Potchama create a whirlpool with its newly-learned attack and ride it to give it a power boost. This unusual technique earns Hikari a lot of points with the judges and enables her to pull through with a victory! Hikari is declared the winner of the battle and is awarded the Sono'o Town ribbon. After saying goodbye to her friend, she tells Satoshi that she'll be cheering for him at the Hakutai Gym. Can Satoshi earn his second Shinou League Gym Badge? So Hikari finally gets her first ribbon. It took Haruka 51 episodes to do the same thing Hikari's done, so I think that says a lot about the character. The final battle between Potcham and Pottaishi was kind of boring, but everything else was great. The dubbed version keeps more music than usual (seven pieces total), but it's still a far cry from where they need to be. The only other notable thing about the episode is the dub's insistence of making these Contests yearly events when there's nothing in the Japanese version to verify that. This isn't the first time they've done this, but I hope it's the last. 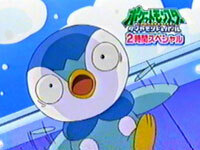 Korotoc joins the short list of DP pokemon who get to keep their Japanese voices in the dub. Marion: "And that, ladies and gentlemen, has brought us to the end of this year's flowery and fragrant Floaroma Pokémon Contest! Don't forget, there are more exciting events on this year's calendar. But we'll see you back here, next year!" Momoan's dialogue is pretty much the same except for the whole "this year, next year" part. The Japanese version doesn't specify how often these events take place, but the dub makes it sound like these Contests take place only once a year. I outlined the reasons why I don't like this kind of change in the comparison for "Harley Rides Again!," so I won't repeat myself here. That overused favorite from the Jouto era, Ready Go!, makes another appearance in this episode. This time, the song plays from the time Pottaishi jumps into Potchama's whirlpool until Hikari is given the ribbon. In the dub, this is all replaced with instrumental music. I wonder why PUSA doesn't just pull out the English equivalent (which would be the Master Quest theme) and use that. They don't seem to have any problem using 4Kids vocals, so why not play it here? It would certainly be better than generic dub dramatic music cue #1898. The last three seconds in the dubbed version of this episode weren't there in the Japanese version.